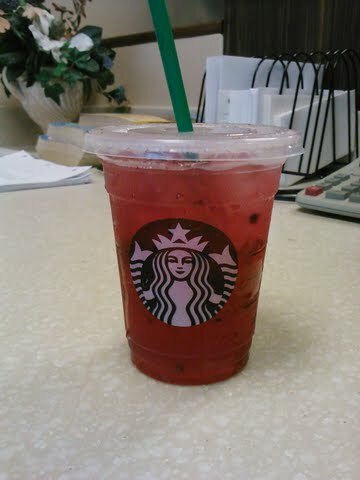 ﻿ Today Starbucks was offering a free sample (tall size) of their new Refreshers beverages from Noon to 3pm. The two flavors it comes in is Very Berry Hibiscus and Cool Lime. I went to Starbucks at my local Target to give this beverage a try. It's a hot day today, so having a free cold drink to cool me off was prefect! I decided to try the Very Berry Hibiscus since I like berry flavored drinks. The drink from the picture posted in Starbucks looks very good so I knew this drink would have a great sweet taste, but boy did I thought wrong! When I took a sip of my Refresher drink, it did not have a very good taste and it left a bitter aftertaste in my mouth! Every sip I took had blackberry seeds! The taste was not very sweet and kind of reminded me of the Raspberry Passion Fruit Ice Tea but with a bad taste. Such a disappointment! Even on Starbucks Facebook page, people complained about both beverages not being good. Starbucks missed the mark on these two drinks and I know it'll not last. The drink has low calories and mixed with real whole blackberry, fruit juice, and green coffee extract. You would think with these types of ingredients it would taste good. Also Starbucks says that the drink will help energize you, well I don't feel energized at all! I'm glad I didn't pay for this drink and will not try the Cool Lime either! Is Starbucks Refresher Worth a Try? ﻿No! It has a bitter taste and doesn't taste good. If you want a freshing drink, try the Passion Fruit Teas, they're very good! I got a chance to sample the Cool Lime Refresher the other day, and to my surprise it wasn't that half bad. It has a bit of a tangy lime taste that's not too tart or sweet. But question is, would I buy it? The answer is no, not worth the price. They are OK but HOPE they (Starbucks) get rid of that “Rebaudioside A” sweet enhancer since the formula already contain Cane Sugar and Grape Juice. Just following up an old rule…If you find it contains very hard to pronounce ingredients, don’t eat it. I never knew this but I've been cutting down on going to Starbucks because now every time I go there and have one of their drinks, my stomach gets upset.